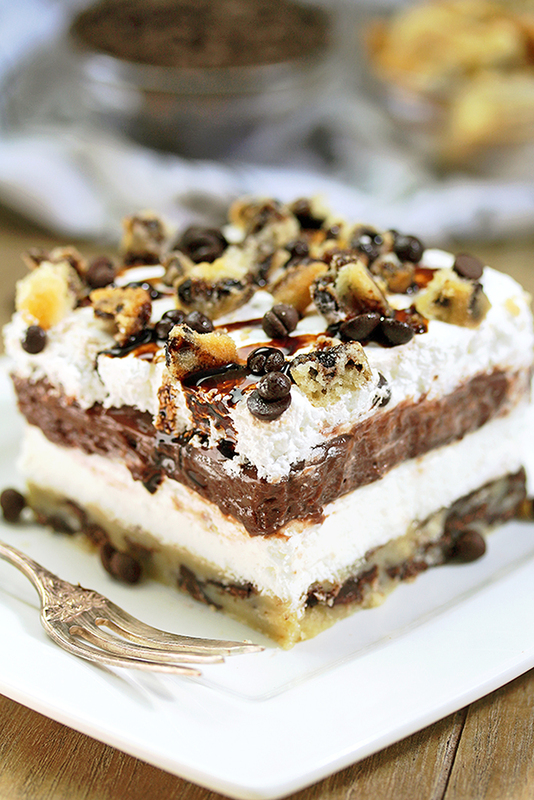 Chocolate Chip Cookie Lasagna is a light and creamy dessert with chocolate chip cookie crust. Is there anybody who doesn‘t like chocolate chip cookies? With a glass of milk, maybe? Have you tried them in a form of some other dessert? 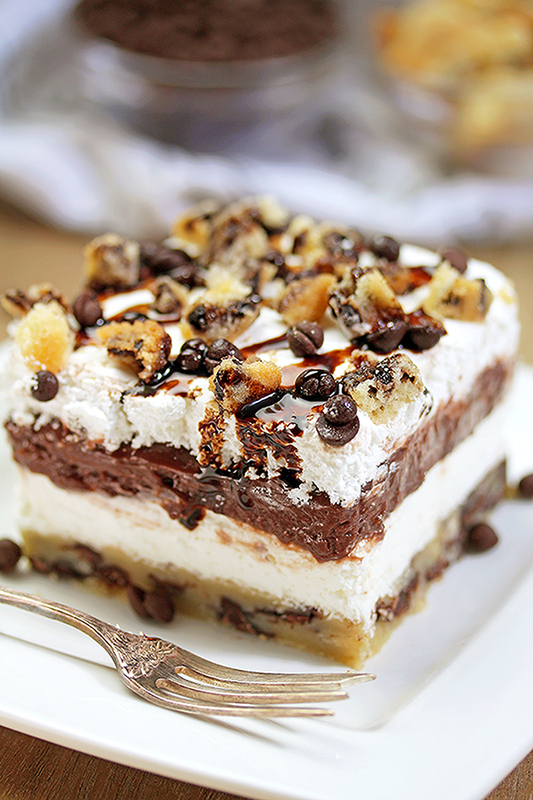 We‘ve tried various chocolate chips desserts, but our favorite is Chocolate Chip Cookie Lasagna. 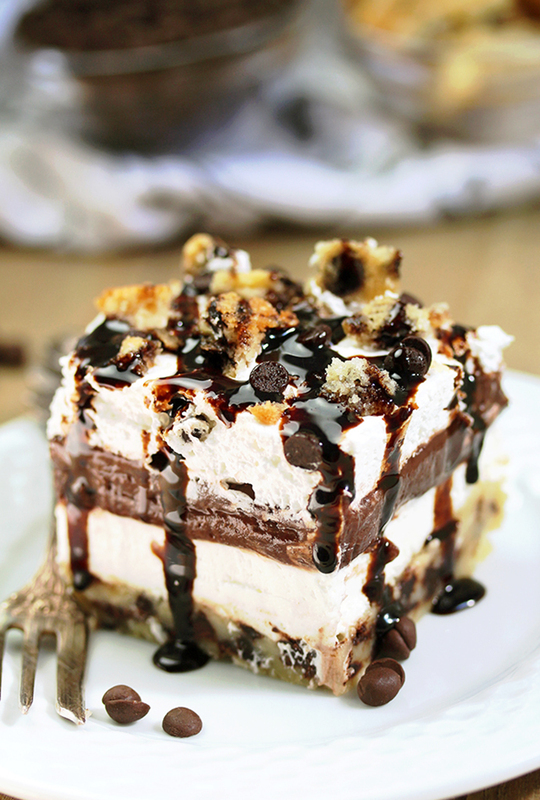 It consists of a chocolate chip cookie crust and three different layers-three different tastes. Altogether, they make perfection. 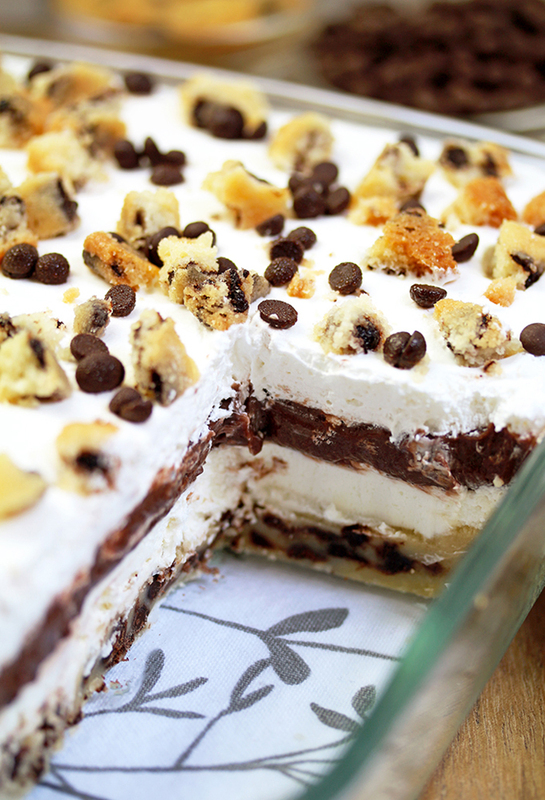 First, there is a chocolate chip cookie crust, then cream cheese filling, a layer with chocolate pudding follows and cool whip with cookie pieces, chocolate chips and chocolate topping on top. Yummy! 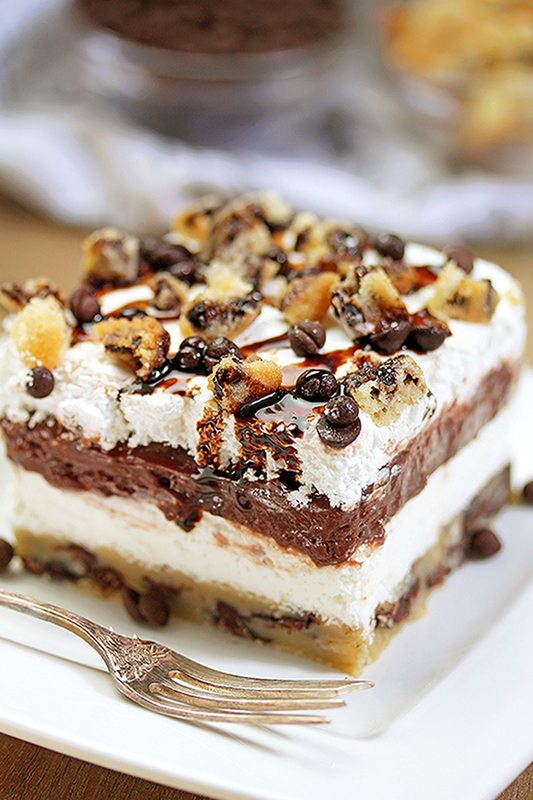 Crunchy crust + creamy layers = winning combination of Chocolate Chip Cookie Lasagna. It’s delicious and light and so easy to prepare. Everyone in my family loves this dessert, especially my son, because all his favorite flavors are in this dessert: chocolate chip cookies, chocolate pudding and cool whip. 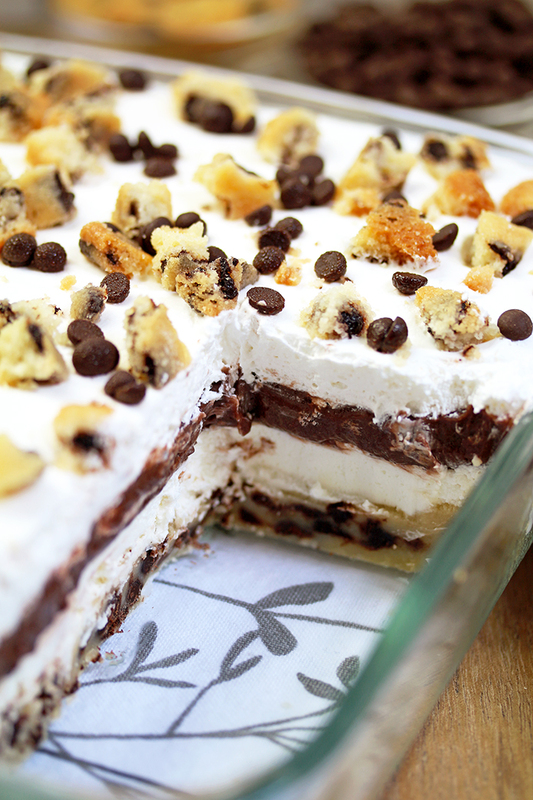 Chocolate Chip Cookie Lasagna is easy to make since the cookie crust is the only part that you have to bake. Chocolate chips cookie fans should take a look at our most popular recipe Chocolate Chip Cheesecake Cookies, Chocolate Chip Mini Cheesecake and Peanut Butter Chocolate Poke Cake. If you like chocolate, check out Chocolate Mousse Cake, Double Chocolate Cheesecake Cookies and No Bake Chocolate Peanut Butter Mini Cheesecake. If you are looking for some great desserts visit our Desserts page. 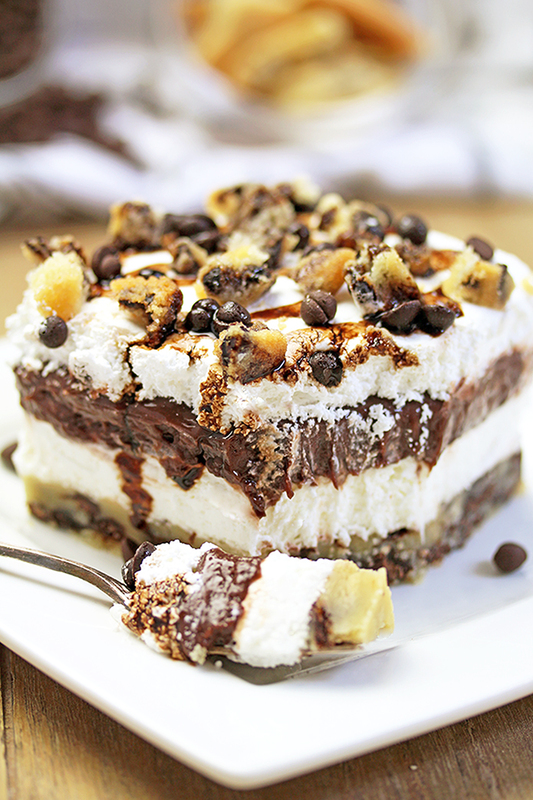 Chocolate and chocolate chip fans, this one is for you only. It will be one of those recipes that you are definitely going to keep. Enjoy! Chocolate Chip Cookie Crust – Preheat the oven to 350 f. Line with parchment paper or spray with non – stick spray 9 x13 inch baking pan. Set aside. In a large dish beat butter and light brown sugar, on medium speed, until creamy. Add an egg and 1½ tsp vanilla and beat until well combined. Add flour and salt and beat, on low speed until you get fine dough. Fold in 1 cup of the mini chocolate chips. Spread evenly into a baking pan. Bake for 16-18 minutes. Take out of the oven and leave to cool completely. To make a Cream Cheese Filling – Beat cream cheese, sugar and ½ tsp vanilla until fluffy. Fold in 2 cups of the cool whip, using spatula. Spread evenly over the chocolate chip cookie crust, completely cooled. Set aside. To make Chocolate Pudding – in a medium dish pour milk, then beat, on medium speed, slowly adding instant chocolate pudding powder, until it thickens- for about 2 minutes. There shouldn‘t be any crumbs. Spread evenly over the cream cheese filling. Put the rest of the cool whip over the chocolate layer, with crumbled cookies,rest of the chocolate chips and chocolate syrup on top. Keep refrigerated for at least 4h, possibly overnight.